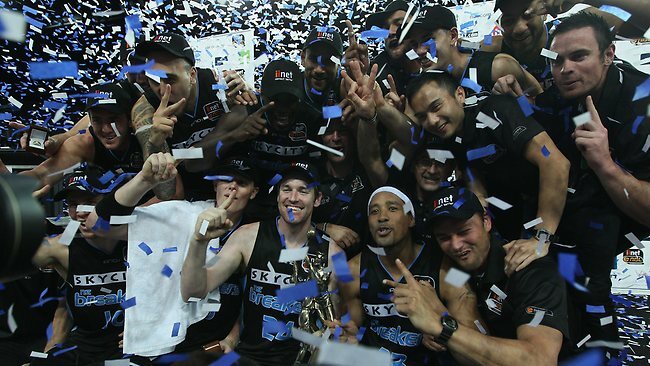 The New Zealand Breakers took back to back championships last night defeating the Perth Wildcats 79-73. It was an intense game that showed the closeness of these two fierce rivals. The production of the Sky Sports game was so much better then OneHD, it had more cameras, better lighting and sounds. Two words Slow mo. The New Zealand Breakers came out with the lead and the Wildcats just stayed with them the entire game. Every player on the court stepped up and showed what they can do. I doubt if the Breakers will manage to hold onto a lot of there players next season, with other teams looking to recruit them. C.j Bruton was the finals series Most Valuable Player and rightly so, as he is the embodiment of the word Clutch. For the Breakers Gary Wilkinson finished with a game high of 23 points, Bruton 16 and Cedric Jackson had an impressive 12 assists. Starting, both teams missed a couple shots until Tom Abercrombie drained a 3 followed straight after with Wilkinson getting one from the perimeter to give the breakers a 6 point lead, but the Wildcats fought back. Bruton gave the breakers a quick 5 off the bench and finished the quarter at 21-22. Going into the second quarter, Matt Knight stepped up by draining some mid range jumpers giving the Wildcats a 5 point lead. The Breakers looked stagnant and the crowd could see it. Few plays were run and the skill of each player kept them close. Until Wilkinson drained a 3 followed by a huge alley oop by Alex Pledger. The crowd had become tense with that 5 point lead, but the dunk got them to their feet. The next possession Pledger again goes for the dunk, but was fouled hard by Matt Knight. It was a good foul if he had of dunked it, the crowd would have been at a frenzy. Knight had an impressive second quarter and couldn't be stopped without a double team and he finished the half with a quick 3 point play. But Cedric Jackson destroyed the defence with some excellent penetration to get to the basket and repeated it with the last play of the first half keeping the breakers close 41-39. Wilkinson reclaimed the lead after the break but couldn't make a layup missing 3 easy ones. Cedric Jackson missed 3 of 4 free throws and the Wildcats stay within striking distance. I'm not sure if I heard it right, but i think Coach Beveridge said to the Wildcats at the time out "If you don't foul them your coming off". I do not like how that guy coaches. Robbins gets a lucky call from the refs as he smashes into Wilkinson, dropping the shoulder and drawing a foul. A dirty play that refs fell for as Wilkinson goes sprawling across the floor. I think the referee thought he was reffing in Perth. Tom Abercrombie then tips in a big alley oop pass from Cedric Jackson, to close out the 3rd quarter with the breakers taking a 58-54 lead. The Alley oop from the injured Abercrombie was a huge lift for the crowd and the team going into the final break. Going into the fourth the margin grew to 8 points, the biggest of the game until Cam Tovey and Kevin Lisch drained some big 3's to level the score with 7 mins left. Gary Wilkinson's little mid range jumper is a force that cannot be stopped and this was followed by a 3 pointer from CJ Bruton, that gave the breakers some space. Shawn Redhage nailed a quick 3 to keep the Wildcats in the chase, but only down by 3. Redhage again looked like he was going to make the big plays at the end of the game, going up for a lay up to take them down by 1. But Tom Abercrombie came from nowhere to block Redhage's layup pinning the ball to the backboard. CJ followed this up with a big 3 pointer in front of Lisch and with a final foul on Cj bringing the ball up the court, he made the free throws and the game was over 79-73. The New Zealand Breakers had an excellent team this year and are well deserved champions. It was an epic finals series and some say the best in NBL history. CJ Bruton at 36 years old, took out his 5th NBL championship ring and I would say most of those players will be looking for another contract next year. If you missed the final series games, I suggest watching them.